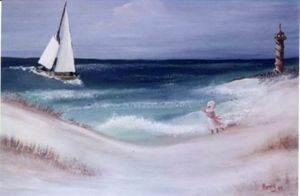 Three paintings all rolled into one that will take you to your very own sea escape. Capture the feeling of being on any sea shore with your customised colors to enhance any room. Born in the foothills of WV I am a self taught artist. Every piece of art is done with passion from my heart. Now living in the Shenandoah Valley with the Blue Ridge and Appellation Mountains all around me my passion for art is greatly imspired. I hope you enjoy my God given talent.